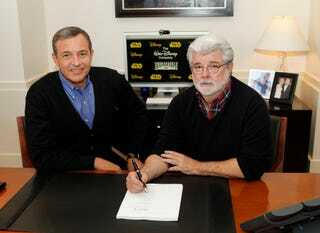 Just kidding, it's Robert A. Iger, chairman and CEO of the Walt Disney Company, and George Lucas, chairman and founder of Lucasfilm (der) signing the agreement for Disney to acquire Lucasfilm. Cool, it's two old rich white guys doing a deal for billions of dollars, totally unusual, nothing to see here. Oh, huh. I guess Princess Leia is a Disney princess now? Does that mean she'll have to lose 15 pounds, burst into song inappropriately, and start dressing exclusively in taffeta? HERE'S HOPING.